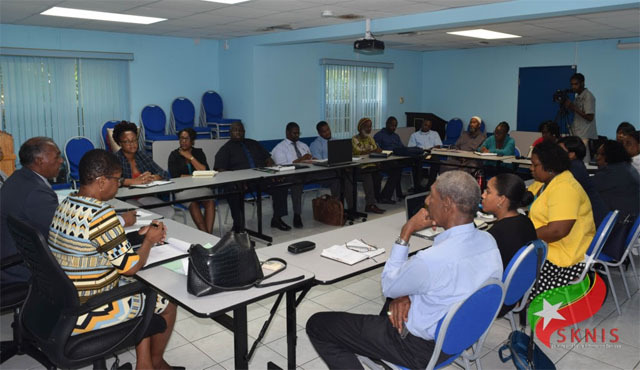 Basseterre, St. Kitts, February 05, 2019 (SKNIS): Members of the Minimum Wage Advisory Committee are working diligently to review all the necessary facts and related materials as they consider the current rate of pay which stands at $9 per hour or $360 per week for 40 hours of work. The Committee was formed on November 13, 2018, by Senior Minister and Minister of Labour, the Honourable Vance Amory, and is made up of members from tripartite agencies – representing government, private sector, and employees. Labour Commissioner Shernel James chairs the committee. She said that the group meets monthly and is presently “discussing position papers put forward by various members of the Committee. “The work is going very well,” she said, noting that position papers were submitted for consideration by the Labour Department, Eastern Caribbean Central Bank, St. Kitts and Nevis Trades and Labour Union, St. Kitts Evangelical Association, Department of Youth Empowerment, the Social Security Board, and the Ministry of Sustainable Development. “We are yet to receive the position papers from a critical block, that is the employers’ representatives. However, by the time the Committee meets [this month] this will be forthcoming,” Ms. James added. The review is expected to be completed by June 2019. The findings of the Committee will be forwarded to the Cabinet and will help to create a criterion for the next minimum wage review, Commissioner James explained. The members of the Minimum Wage Advisory Committee are appointed in accordance with the Labour Minimum Wage Act Chapter 18.19. Officials from government are drawn from the Departments of Labour, Youth Empowerment, Sustainable Development, Statistics, Finance, Trade, Consumer Affairs, Gender Affairs, Social Development, Human Resource Management, and Legal Affairs. The employers’ representatives include members from the St. Kitts and Nevis Chamber of Industry and Commerce, St. Kitts Chapter of Private Security Association, St. Kitts Building Contractors Association, Manufacturing Council, and the St. Kitts and Nevis Hotel and Tourism Association. Workers’ representatives come from the St. Kitts and Nevis Trades and Labour Union, St. Kitts Teachers’ Union, United Workers Union, and the Nevis Teachers’ Union. Civil Society is represented by the St. Kitts Christian Council, Nevis Christian Council, St. Kitts Evangelical Association, Nevis Evangelical Association, the local Islamic Association, and the Organization of Rastafari Unity. Key stakeholders in the process include the St. Christopher and Nevis Social Security Board and the Eastern Caribbean Central Bank.